When I was approached about this family session, we looked at several locations, but couldn't quite find what we wanted. As the day came closer, rain was forecasted, so we had to find somewhere with a great backdrop while also providing shelter from the weather. Enter Umstead Park. Easily one of my favorite locations in the Raleigh-Durham-Chapel Hill area, Umstead is a state park full of opportunities at every turn. Located between I-40 and Glenwood Avenue, the park is convenient to almost anywhere in the area, with shopping and eateries abundantly near by. Umstead offers gorgeous color in the fall, beautiful, shady greens in the spring and summer and the remnants of fall during the winter. 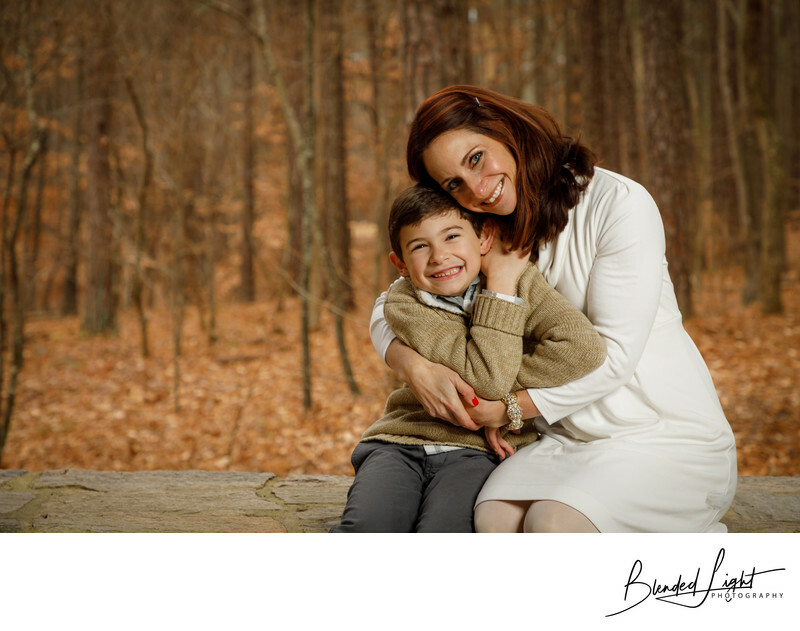 With ample trails and a large lake, Umstead is a great location for photography sessions, regardless of the type. The park is also very large, so rarely would you have to use the same spot twice. The entire area is treed so there's ample room for several photographers at once without anyone intruding on another's session. One of the features key for this session was the large, covered picnic shelters. With beautiful stone work and open framed roofing, the shelter offers a great view of the surrounding area. Additionally, they added the required shelter from the rain. After we were done with larger family images, we took some time to do some individual family shots. This one of mom and son stood out as both beautiful and fun. Just at the age of not wanting mom to give him hugs in public, she did it, not only in public, but in front of a camera capturing the whole thing. You can feel the love and enjoyment of the moment and the connection between the two in this brief second of beauty and silliness. This is exactly what I love about family engagement photography - the relationship, the love, the fun! 1/160; f/5.6; ISO 400; 85.0 mm.